PrintFriendly makes printing on the web better. You'll save paper and ink, plus get great looking documents. These changes only affect Publishers using the PrintFriendly & PDF button on their websites. The PrintFriendly plugin from its inception has been advertisement supported. This allowed us to deliver value to publishers, like you, at a fantastic price - Free! Unfortunately, we’ve been forced to discontinue advertising in the plugin, so we are having to make some changes. This change will not affect the vast majority of websites. However, some websites will need to upgrade to PrintFriendly & PDF Pro. Which websites need PrintFriendly & Pro? Password protected pages (ex: members only pages). Intranets, or sites not accessible from the internet. What should I do to restore PrintFriendly & PDF functionality if my site is affected? Simply purchase Printfriendly & PDF. How can I check if my site is affected? You can check by copy/pasting the URL of a post page (not a category or home page) on https://www.printfriendly.com/url-check. What should I do if my site is not affected? Nothing! You’re all set, no further action required. Thanks for your support! We look forward to serving you in the future. We're excited to launch the new PrintFriendly, PDF and Email button designs! We hope you like the new look! Many people requested that we include an email icon (because PrintFriendly does more than print, and PDF, it also has an email option. This was the most popular option. Current users should update their PrintFriendly & PDF button code to get the new buttons and ensure you're getting the best graphic and latest features. WordPress, Drupal, Joomla users, look for a new plugin update soon! Would love to tell you the backstory of this button, and why it took so long, but we're too busy! Back to work for now. With todays digital cameras, pictures are getting larger, often too large. This can take up unwanted space in the printed or PDF version of the webpage. Here's an example of wonderful Sloppy Joe Baked Potatoes recipe. You'll see the images are great, but they're too large. Problem is, when you print or save as PDF, each image can take a full page! 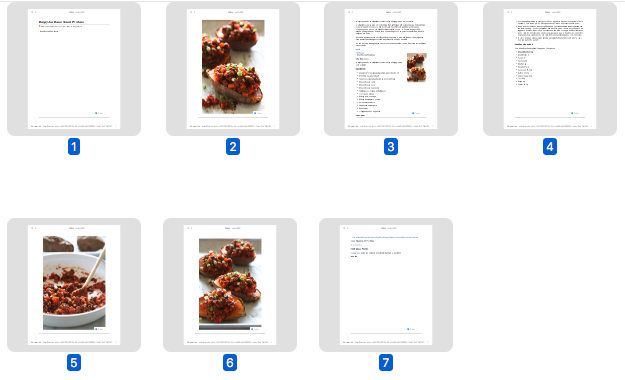 In total, this recipe takes 7 pages. Turn seven pages into two! 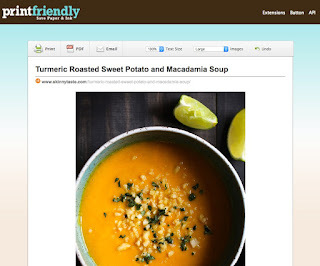 With PrintFriendly's new image feature you can save five pages! Not only does this save paper and ink, but it can also be nicer for reading. The new image feature is available in the PrintFriendly & PDF Browser extensions. 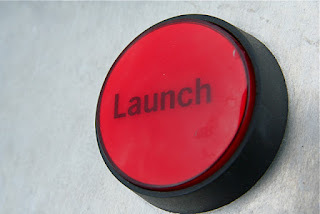 Do you have a recipe, knitting or blog/website this is the perfect feature for your print button. You can get the PrintFriendly & PDF WordPress Plugin, Blogger Widget, Drupal Module, and HTML button. You can also use directly at PrintFriendly.com. We just launched PrintFrienldy & PDF Pro! Publishers (websites) can buy our pro service for their website. Ad-Free: Pretty simple, there's no ads. White-Label option: Removes "Powered by PrintFriendly & PDF" and all other branding. Unlimited printing and pdf generation. Customization options like header, footer, copyright, etc..
Who needs PrintFriendly & PDF pro? Well every website of course! Help your readers save paper and ink when they print, plus get a better reading experience. We created the pro option originally for non-profits 6 years ago (we used to charge through paypal), and the price is still the same today. $3.33 per month is all it takes to get PrintFriendly & PDF Pro if you sign up for a year; that's less than a cup of fancy coffee! Servers. PDF generation is intensive and we use the best CDN networks and backends to ensure fast and reliable service. Also the hosted button images, css, js files add up. Ongoing improvements. We're passionate about creating a quality product and don't want to mess around with versions and holding off releasing something great until we can charge more. Buy Pro service for your website (domain). PrintFriendly & PDF pro service applies to any and all pages on your website. Subdomains: Do you need PrintFriendly & PDF service for a website and multiple subdomains? White-Label: Removes "Powered by PrintFriendly.com and all other PrintFriendly & PDF branding. If you've been using PrintFriendly for a while, you already know that PrintFriendly can automatically translate to your language depending on the language settings of your web browser. However, we have a limited number of languages that our plugin has been translated into. And we'd like to make PrintFriendly available in more languages. For this, we need your help. If you want to see if PrintFriendly is available in your language, simply go to the PrintFriendly plugin page and scroll down to Supported languages heading. If you are not seeing your language in there, you can help us add it! Hey everyone! Today we're going to show you a quick tip on how to add PrintFriendly browser tool to the bookmarks bar on Mozilla Firefox latest version. As of now, the latest version available for Windows computers is 35. So we've made a nice little animated GIF file for you which you can see to learn how to add the PrintFriendly button to your bookmarks bar in moments! We launched a new feature for publishers using the PrintFriendly & PDF Button… Image alignment. By default we align image to the right, allowing text to flow Left-to-Right around the images. Generally this is best for readability. However, align-right doesn't work well with certain kinds of content (like step by step instructions). Now publishers can choose image alignment when they get the PrintFriendly & PDF button. Subscribe to our blog via Email to receive new feature updates, known issues, tutorials and more right in your inbox! Rest assured, we don't send spam mails. Print Friendly helps you save paper and ink when you print. Plus you get great reading printed documents. Our algorithm cleans optimizes webpages for print. We remove the ads, navigation, and junk you don't want to print! 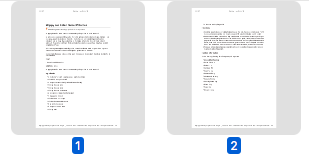 Customize your print outs by removing content and images. You can print, or get PDF of your custom page!